William Wyler directs this historical epic starring Charlton Heston in the title role. 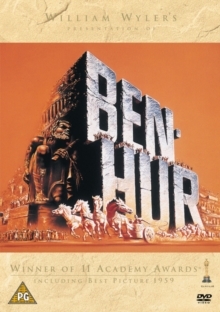 Judah Ben-Hur (Heston) is a Jewish prince who falls out with his close Roman friend Messala (Stephen Boyd) when he refuses to promote Roman rule over his people - his mother and sister are imprisoned and he is enslaved. Hur plans and achieves revenge after three years as a slave and later becoming a charioteer, but finds true peace when he returns to Jerusalem and joins the new following of Jesus Christ. The film won eleven Academy Awards including Best Picture, Best Director, Best Actor in a Leading Role (Heston) and Best Actor in a Supporting Role (Hugh Griffith).